Okay, I have played the game several times when I sat to play the game with one of my friends. He never played the game before and I taught him the game. We played with the basic cards and what he did was kinda amazing. It opened my eyes, showing me what can you do differently. You know there are a number of cards of each type based on number of players. The rules did not say you cannot buy the same card, so it’s possible to have more than one of one card. He bought the card that generates one resource (with a gear icon, it costs 2 Sun resource each card) during your turn. The first three rounds he bought that cards, which leave him with 3 cards that generate resources per turn. This is crazy powerful. Before his action, he always has a minimum of 3 resources, it can be golds, suns and moons or in any combination. He never lacks of resources and in the same time he negates our chance to have that card. Obviously, he won that game by miles. Second time, my other friend played with similar move. She bought 2 out of three cards that give you 3 pts when you kick other players or kicked out by others. This simply gives her 6 points easy without doing lot of efforts. So it is safe to say monopoly and stack the card effects are a powerful thing. Okay, they stated in the rules that you can easily remove the die face using an unused face. This may not always be the case, sometime it’s as hard as using nothing and it can slip your grip. Now I luckily has Rattlebones custom dice that on sale at geek store. It has 3 custom dice with different colored faces and a small pick to remove the face out of the dice. 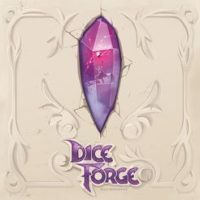 So when I have Dice Forge, I tried to use this pick to remove the face out of Dice Forge’s die and it’s perfect. Just check the geek store, perhaps its still available. Would be best if you get 4 picks, one for each player.